MAKING A MARK: Derwent Art Prize 2014 - ineligible drawing wins first prize? I have two beliefs about art competitions. The first is that if you put your work into an art competition with a significant money prize, then you are putting your work up for critique. I therefore feel able to comment on artwork in major art competitions in a way which I might not for normal open exhibitions. The second is that the work entered should be original and the artist should be able to assert copyright over their artwork. In other words the work should not be a derivative image. Put simply - I have no time for people who copy other people's photographs. There are far too many brilliant artists who create excellent original images to bother with those who copy the images selected and executed by others. copied a photograph taken by another person. there is some really outstanding work in this year's exhibition at the Mall Galleries - which I shall review tomorrow, when I will also highlight the other prizewinners. Below is the correspondence I had with the organisers, Parker Harris, after an artist contacted me with information about one of the drawings which had been selected. This is my email dated 30th July 2014. An image which appears on your gallery for all works submitted in the Derwent Art Prize competition appears to be breaching copyright and has been reported to me. I'm somewhat well known within the online art community for highlighting breaches of copyright in relation to competitions hence people tend to tell me rather than the organisers. This very often happens because the person raising the query is also an entrant in the same competition. I highlight images which breach competition rules merely because it's so unfair to other entrants when images are selected which are either not original and/or breach copyright. My purpose is to encourage people to read the rules and to learn what they can and cannot do - and that sometimes includes the selection panel when they appear to be ignorant of the rules of the competition they are judging. I'm absolutely not in the business of creating any embarrassment for competition organisers. My preference is to ask the competition organisers for their comments first - with respect to use of a copyright image - before commenting on my blog. I'd also add that the nature of the response tends to influence whether and/or how I comment. 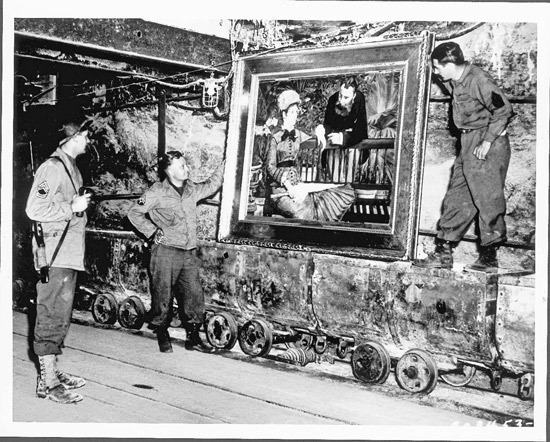 Does Brian Fay have permission of the US Government and/or the Board of Trustees of the Monuments Men Foundation to copy and reproduce these official photographs? copy photographs which are still within copyright that are found on the internet? make copies of works despite the fact that the Derwent Art Prize rules make it clear that copies of works are ineligible? What do you propose to do about these selected images? If the Derwent Art Prize prefers not to comment, please note I will be commenting on the similarity of images which are in plain view on the Internet and reviewing these within the context of the competition rules. I'd also add that, in my experience, these matters are very rarely spotted by only one person. Below is the reply I received from the competition organisers, also dated 30th July 2014. Thank you for the email. This is something we had previously spotted and looked into. The original photograph images are actually all within the public domain, therefore are not protected by copyright as are most images taken or created by the US government and they have been used on many websites as such (see screenshot below). As the image is not protected by copyright, and is not a copy of an artwork but an image of a narrative, the work does not breach any of the rules or guidelines and we are delighted to have it in the exhibition. I decided to wait and see what happened with respect to the drawing in question and would only highlight the issues raised if the work won a prize - as indeed it has done. The letter from Parker Harris clarifies the situation on copyright and I accept that explanation. However I completely disagree with the interpretation which suggests the work is not a copy and suggests it is "an image of a narrative". I don't recall that particular argument ever having held sway in any of the courts which have dealt with issues of what constitutes a copy. In fact I googled "an image of a narrative" and came up with precisely one result on Google - which happened to be a commentary on Jane Austen's 'Persuasion'! So what we have here is a notion - "an image of a narrative" - which does not exist in any form on the Internet. So what exactly is "an image of a narrative"? Your guess is as probably as good as mine! More to the point, if asked whether it was "a copy" or an "an image of a narrative", I am also pretty sure what most people would say! You can make that decision yourself if you view the two images below - the drawing and the photograph - plus you can also add your comments below. Maybe one of you will be able to explain "an image of a narrative" and why this is not "a copy". should not have won any prize. I have no idea whether the judges were made aware that the artwork had copied a photograph before, during or after the judging process. I spoke with the Chair of the judges this evening before the prize giving and it was clear she was aware it was based on a photograph. This is the photograph which was copied. fair to the sponsors who (I'm guessing) obviously want a competition which maintains high standards and is not brought into disrepute in any way. One of the artists, whose work was selected for the exhibition, has written to me and provided some additional and very relevant information. the annotation at the bottom clearly states that this work was completed in 2010.
the date of completion ALSO renders it ineligible for selection for the exhibition and a prize. All entered work must have been completed within the last 3 years. It's common for other art competitions to stipulate something along the lines of "All artwork complete before [specific date] is ineligible for entry". It's normally two or three years prior to the deadline. (The same date procedure is usually applied to any age qualification for the artist). There is no date in these terms and conditions other than as stated above. However if we extrapolate, based on normal convention, a stateent which did stipulate a date for works needing to be completed in the last three years, prior to the deadline, would state "all works must have been completed AFTER 9th June 2011". That clearly renders this prizewinning artwork inadmissible on ANOTHER rule of this art competition. UPDATE: What should happen next? Given the compounding factor related to the date of the artwork - as exhibited on the artist's own website - I feel the organisers have no choice but to consult with Derwent as to the best way forward. Competition organisers must obviously rely on an artist's assertion that they comply with all the rules of the competition. The quid pro quo is that if it emerges that the artist has NOT complied with all the rules of the competition, then he or she must accept that there may well be consequences. However, in order to maintain the integrity of an art competition - and keep faith with all the entrants - both organisers and judges must also be vigilant as to compliance with all the rules of the competition and address issues which arise before and after decisions have been made about prizes. My personal view is that the prize should be withdrawn. Or maybe the artist will do the decent thing and withdraw his work from the competition and not accept the prize? Finally, can I say I have no wish whatsoever to embarrass Derwent with this post. I've always been a huge supporter of Derwent and all they do for pencil art - as they well know. I had a word this evening with representatives of Derwent and told them that I intended to write this post. They made it clear to me that while they sponsor the competition they play no part in how it is conducted. I suggested to Derwent that they might wish to insist on a couple of changes for the rules of the Derwent Art Competition 2015 in order to comply with the standards and wording of other major art competitions. all publication or exhibition of a completed work prior to this date automatically renders it ineligible for the competition. On the topic of derivative works, probably the most well known in recent years is the Shepherd Fairey case re the Barrack Obama "Hope" poster. More particularly in relation to the UK what follows is a summary of the position in relation to derivative works. The following quotations come from Copyright issues for derivative works fact sheet from the UK Copyright Service. A derivative work is a work that is based on (derived from) another work; for example a painting based on a photograph, a collage, a musical work based on an existing piece or samples, a screenplay based on a book. Legally only the copyright owner has the right to authorise adaptations and reproductions of their work - this includes the making of a derivative work. The copyright owner is generally the creator of the original work, or it may be someone the creator has given copyright to (i.e. next of kin). Unless you are the copyright owner of the original work, you will probably need the permission of the copyright owner before making a derivative work. If copyright has expired (under UK law this typically means the author died over 70 years ago), the work will be in the public domain, and may be used as a basis for a derivative work without permission. Provided it is significantly different to the original work the derivative work will be subject to copyright in its own right, and you will own copyright to the new content you have created as a result of your actions. Bear in mind that to be subject to copyright the creation of the derivative work must itself be an original work of skill, labour and judgement; minor alterations that do not substantially alter the original would not qualify. The key words are "significantly different" - and a change of media does not satisfy this requirement. Would love to hear your thoughts on this work? What a shame that this has happened. I do not think it's fair to those who submitted original work. Well done Katherine! I would also debate the value in artistic terms of a straight copy of a photograph - however good and whoever the author of the original photo. What's the point? Brava to you for having this discussion and for speaking / communicating with the people involved who can change this situation [hopefully for the better]. Frankly, this drawing appears to have only changed the original idea by reducing value contrasts to the point in which there seems to be less of a focal point. There is nothing wrong with an artist using a photo, in a broad sense, to create another form of art [copyright laws being followed]. However, when the photo is one that the artist himself has taken, you may now see fully the vision on one mind ...composition, idea, etc. If a competition chooses not to act against entering copies of other images into competitions, they are basically saying that TECHNIQUE is the only real criteria for the judging. And not even all of what is involved in TECHNIQUE. How disappointing on all fronts. This is really discouraging , Katherine. As to the term "image of a narrative," Parker Harris made it up to save face. The prize winner should give the money back. I totally agree with your position on this. I am a member of the South African Society of Artists, and their rules governing entry into their exhibitions are very strict on the infringement of copyright, and the use of photographs. If they are not your own, you require written permission from the photographer. This work should have been disqualified, not guven a substantial prize. This clearly highlights the fact that the organizers and judges of this competition have no idea what constitutes a good original piece of art. As Kelly said, they appear to think it is all about 'technique' (i.e. competent use of the material) and nothing more, which is actually an insult to artists who take time labouring over the design original compositions. Good composition is the foundation of a great artwork! By awarding the prize to someone who has copied another person's image they are completely disregarding this factor which is in truth just as important has the handling of he material. They are in effect ignoring the 'thinking' part of the creation process. 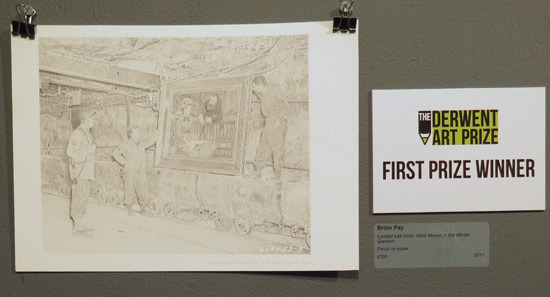 Brian Fay composed not one element of his drawing. Everything, including placement of objects, lighting, tonal design and subject matter were already set up for him by the true artist behind his drawing: the photographer of the original image. 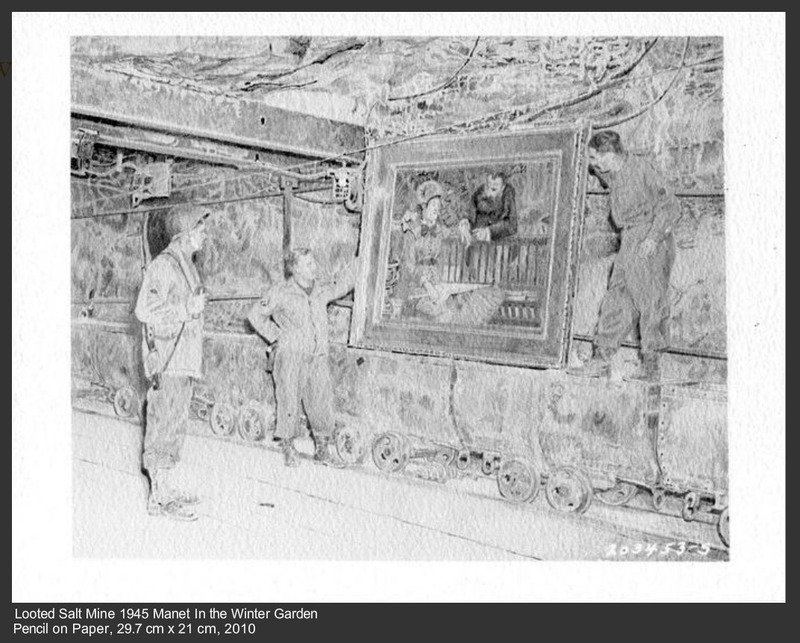 A copy of a public domain image is still a copy. Current copyright status is irrelevent. Sad to see this response from Derwent, as it really isn't complicated in this case. I can understand that they have no time or resources to check the date of every piece and must rely on artists' honesty. Shame on the artist for that. It's worrying when an artist hasn't produced anything new in nearly 4 years to submit to a prize exhibition. The organisers are responsible for the eligibility of work and exercising vigilance when legitimate concerns are raised. IMO the judges are responsible for ensuring that all prizewinners are appropriate and clearly comply with the rules of the competition. My view is that Derwent do have a role to play when major issues of concern arise - not least because of the marketing implications and the negative impact on their image. IMO they need to at the very least to satisfy themselves that this work is eligible for the competition. I'd also recommend they and the organisers look carefully at my recommendations re the terms and conditions with respect to future competitions. Even if Derwent is not responsible for such decisions, I think it has really tainted that exhibit. It's not fair to all the other artists who complied with the competition rules....I mean what kind of message are they sending here! And to say it wasn't a copy is just ludicrous and insulting to all the other artists! I keep looking at the work to see the artistic merit in it but I can't even see that. It does not grab my attention in any way. To my eyes it is quite frankly, boring. I think you are actually being kind calling it a "copy". I think it's a tracing, or at least drawn using one of those projector things that art shops sell to amateurs with more money than originality. I do think it's also a same that the winning drawings in this competition are always super-detailed, rather than instinctive drawings.Too much emphasis on the technical ability to use a pencil, rather than genuine talent. David - one artist wrote to me and said they had superimposed the images on one another. However a copy is a copy is a copy and it doesn't have a place in a competition which says "no copies"
This has happened before with a Derwent Prize in the late 1980s or early 90s being a direct copy of a black and white photo of a Mohawk Indian, the photo had been sold to Kodak for advertising and copied by the artist. I believe the case was settled out of court by the photographer being awarded the prize money and the image withdrawn from the competition. It's sad that so called artists are incapable of creating their own visions and have to rely on others to show them how the world looks. :-) I once had an artist explain to me in great detail the skills and professionalism required to copy and photograph meant the copy did not breach copyright. He was totally aghast when I started to set up a camera and lighting setup at one of his exhibitions claiming that my skill as a photographer and photographic printer allowed me to copy his paintings and sell them as my own !!! !